If you’re like most homebrewers, you probably started out using malt extracts as the basis for your beer. You might even still use them—after all, if it ain’t broke, why fix it? And with enthusiasm for homebrewing sweeping the nation, you’ll find a range of top quality extracts to choose from no matter what beer style you prefer. But if you’re in love with the tinkering and TLC that come with homebrewing and want to be more involved in how your beer is made, all grain brewing is a natural place to start. It does requires a bit more planning and equipment than extract brewing, but don’t worry. You won’t have to get a doctorate in horticulture to get the most from your grain. Let’s start with the basics. The primary difference between all grain brewing and brewing with extracts is who’s making the extract that will provide the base for your delicious beer. In the case of malt extracts, the conversion of malted barley into an extract is done for you by someone else. The malted barley has undergone a process called mashing—basically steeping the grain in hot water—to convert starches into fermentable sugars, and activate enzymes present in the grain. When brewing with extracts, you can simply order your favorite variety online, or pay a visit to your local homebrewing supply store. But if you’re feeling a little more ambitious and want to dig into the details of the brewing process, you’ll need to mash your own grains to create an extract. This process is more than just a hot soak. During a typical mash, you’ll combine and heat crushed malted barley or other fermentable grains with water and adjuncts, unmalted starches, sugars, fruits, and other add-ins designed to alter the properties of your beer. Time and temperature are closely controlled during the mash in order to activate various enzymes, and dissolve starches. A Note on Adjuncts: We’re focusing on beers that only use malt barley, but if you’re planning on using adjuncts in your mash, they’ll need to be gelatinized before adding them to the mash. This is often done separately, depending on the type of grain you use, since different recipes call for different temperatures and timing for adding them to the mash. Before we get into how to mash, it’s important to have a general idea of why you’re doing what you’re doing. So let’s take a look at the two kinds of specialized proteins called enzymes—diastatic and proteolytic—that will be most important to you as a homebrewer. For all grain brewing using a single-step infusion mash, diastatic (or diastase) enzymes are the most important protein on the block. These enzymes convert starches into sugars, and are activated at temperatures between 126°F and 153°F (52°C and 67°C). You’ll encounter two types of diastatic enzymes as a homebrewer: alpha-amylase and beta-amylase. They have different roles to play, but both are critical to the quality and taste of your finished beer. These enzymes break starches down into dextrins (a type of carbohydrate), which don’t ferment but do contribute to mouthfeel and body in the final brew. This process is called dextrinization, and it works best at temperatures between 149°F and 153°F (65°C and 67°C). The more dextrins that are developed, the heavier the body of your final beer will be. This powerful protein is responsible for breaking the starches in your grain down into fermentable sugars. The action of beta-amylase is called saccharification. These enzymes are best activated at temperatures between 126°F and 144°F (52°C and 62°C), and increase alcohol content while lightening body. Best activated at temperatures between 113°F and 140°F (45°C and 60°C), proteolytic enzymes are also known as protease enzymes. In the method of mashing known as two-step infusion, the mash is held within this temperature range to activate various proteolytic enzymes. This process is known as a protein rest. You can “switch on” different proteolytic enzymes at temperatures throughout the activation range. Between 113°F and 122°F (45°C and 50°C), for example, enzymes responsible for breaking proteins down into the amino acids that will provide nutrients to yeast during fermentation are activated. Just how important these low-temp enzymes are to your brew will depend on how long your grain’s been allowed to germinate. When using what’s known as a fully modified barley, these yeast nutrients are already developed through the malting process. So you’d really only need to worry about this stage in the protein rest if you’re using undermodified malted barley or other grains. At the high end of the temperature range, between 122°F and 140°F (50°C and 60°C), other proteases are activated, breaking down proteins that will contribute to the clarity of your beer and the quality of its foam. 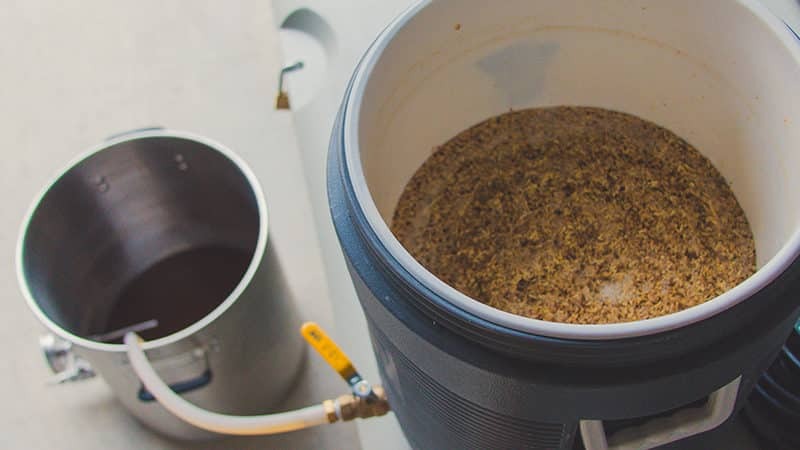 The two most popular homebrewing mash methods are single-step infusion and (you guessed it) two-step infusion or temperature-controlled mashing. Because two-step infusion involves holding the mash at varying temperatures for different lengths of time, it requires a little more finesse and planning. We recommend you begin with single-step mashing and then move on to two-step infusion mashing once you feel ready. This mashing method involves holding the mash at a single temperature, typically between 150°F and 158°F (66°C and 70°C), for 30 to 60 minutes. Single-step infusion works well with fully modified malts that do not need a protein rest. Higher temperatures give your beer a fuller body, while lower ones will produce a lighter brew. In this method, the mash is held at two different temperatures for specified lengths of time. If you’re using undermodified malts, incorporating the second step in the process—the protein rest—can improve the foam quality, head retention, and clarity of the final brew. For a two-step infusion, the mash is first brought to a temperature between 113°F and 140°F (45°C and 60°C) and held there for 20 to 30 minutes. This is the all-important protein rest, which breaks parts of the grain down into dextrins that will feed the yeast during fermentation. Next, the temperature of the mash is raised to between 150°F and 158°F (66°C and 70°C) for 30 minutes. This is called the saccharification rest, and is when starches in your malt are converted into sugar by the action of the diastatic enzymes. After the starches have been fully converted into sugars through mashing, the liquid extract—known as the wort—is strained off the spent grains through a rinsing process known as lautering or sparging. If you’re an experienced homebrewer, you’re probably already familiar with most of these items. But for all grain brewing, you might need to update your shopping list—especially if you’re new to this method. The first rule of Mash Club: Don’t talk about Mash Club. The second rule: Contain the grain! You need something to hold your grains and water at a particular temperature during mashing, and a tun fits the bill to perfection. You can also use a specialized version known as a lauter tun, which allows you to drain off the liquid wort from the grains. This type of tun is especially handy during a one-step mash. 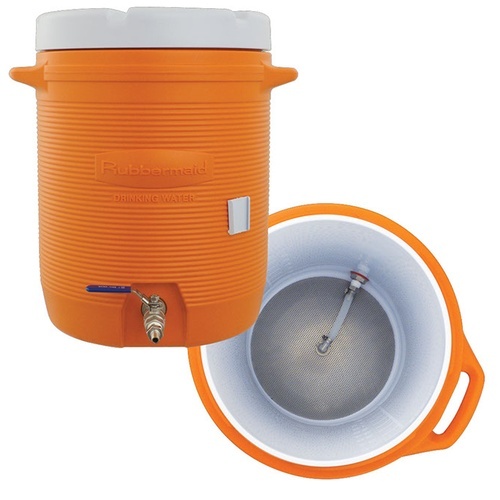 A 5- to 10-gallon (19- to 38-litre) cooler makes a great mash tun. Using a cooler gives you plenty of high-quality insulation and makes it easy to hold the temperature steady for the entire 30 to 60 minutes of mashing. A lauter tun will have a false bottom made of mesh. It acts as a colander to keep the mash above and separate from the liquid wort below. You just push the spigot and let your wort flow, without worrying it will be clogged with grist. Another popular mash tun option is a stainless steel kettle. Adding a false bottom will allow you to use it in the lautering stage as well. 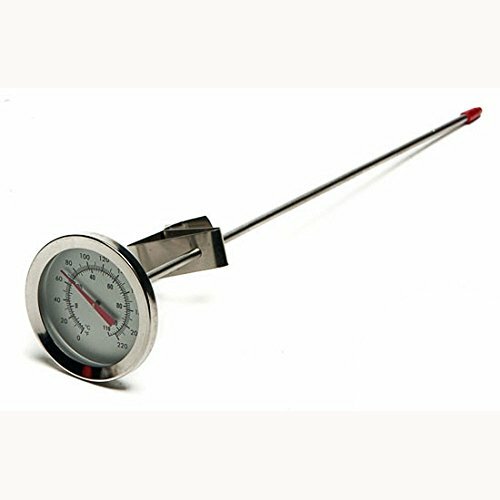 Some even come with an attached temperature gauge for handy measuring. One advantage a kettle has over a plastic cooler is that it can be placed directly on your heat source, allowing for easy temperature adjustments. If you’re using the two-step infusion process while all grain brewing, this can save you some time and frustration. Once you’re finished mashing, you’ll need to boil your wort. We recommend an 8- to 10-gallon (30- to 38-litre) stainless steel brew kettle for this purpose. If you’ve been using a smaller kettle, it may be time to invest in a larger one. Consider this: to finish with a 5-gallon (19-litre) batch of all grain brew, you’ll usually start with between 6 and 7 gallons (23 and 26 litres) of liquid wort after mashing and sparging. This will then be reduced down to between 5 and 5.5 gallons (19 and 21 litres) over the 60 to 90 minutes required to boil the wort. You need room for the wort, and to prevent boil-overs. 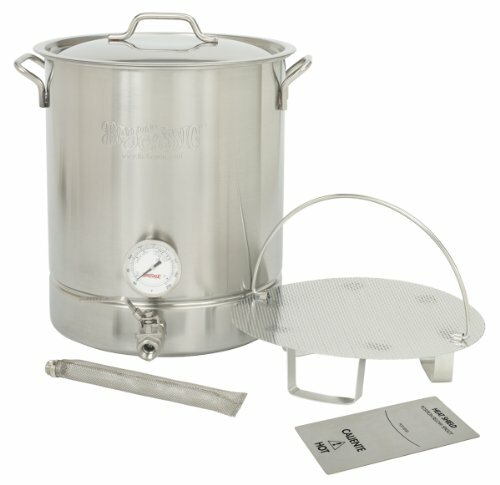 In addition to vessels for containing and boiling your wort, you’ll need a few more items to complete your brew. Your specific recipe will detail the amounts of each ingredient, as well as times and temperatures for each step of the brewing process. Once you have your equipment and your ingredients, you can get started. The only thing between you and brewing is a proper scrubbing. Of your equipment, that is, although you’re welcome to take a shower if it puts you in a brewing mood. 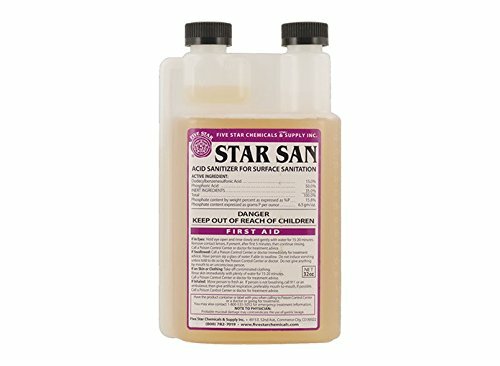 Clean and sanitize all your equipment with a quality brewing sanitizer. Remember, clean, sanitized equipment makes for safe and happy beer drinking. When everything’s as pristine as you can make it, it’s time to brew-it to it! Different types of grains call for different mashing temperatures. Follow the recipe carefully—for example, let’s say your beer calls for a mash temperature of 150°F (65.5°C). You’ll want to heat your strike water—the water used to soak the grain during the mash—to approximately 16 to 18 degrees higher than your target mash temperature. Since the target mash temperature is 150°F (65.5° C), you’ll heat your strike water to around 168°F (75.5° C). 3.6 kilograms @ (.95 liters per .45 kg) = 8 liters x .95, or 7.6 liters of strike water. Before you add the strike water, heat a gallon of water in your pot or kettle to boiling, then add it to your mash tun and let it sit for 5 minutes. This will warm up the tun and keep it from lowering the temperature of the mash too drastically. When the 5 minutes are up, return the water to the pot; you’ll be using it for sparging. Note: If you’re using a kettle to heat your strike water and then adding grain to it, you can skip this step since the kettle will warm with the water. Next, pour some strike water into the mash tun and then add a handful or more of grain. Alternate between water and grains, stirring frequently to prevent clumping. Once you’ve got all the strike water and grains added to your tun, it’s time for a temperature check. A floating thermometer comes in handy here. Add it to the mash mixture and close the lid. After 30 seconds, take a temperature reading. If the temperature is within 1 degree of your target mash temperature, simply let the mash rest with the lid on. Continue to stir and check the temperature every 20 minutes or so. If the temperature falls too much, add up to ½ quart (.47 litres) of boiling water, and stir until the temperature rises. On the other hand, if the temperature is too high, take off the lid and give your mash a stir to cool it down. Although they’re used interchangeably by some homebrewers, sparging and lautering are distinct terms. When you pour the hot sparging water over the spent grains in order to deactivate the enzymes, you’re sparging. Once the sparging is done, you’ll lauter your mash, or separate the grains from the liquid wort. Thirty minutes into the mash, use your sparging kettle to heat 1.5 times the amount of water you used for your mash to 170°F to use for sparging. Since this recipe used 2 gallons (7.57 litres) of water to mash, you’ll need 3 gallons (11.36 litres) of water for sparging. After 60 minutes, you’re ready to check for starch conversion and a thorough lautering before you boil your wort. Before you can extract your wort and boil it, you need to be sure the starches in your mash have fully converted to sugars. Iodine makes this easy. 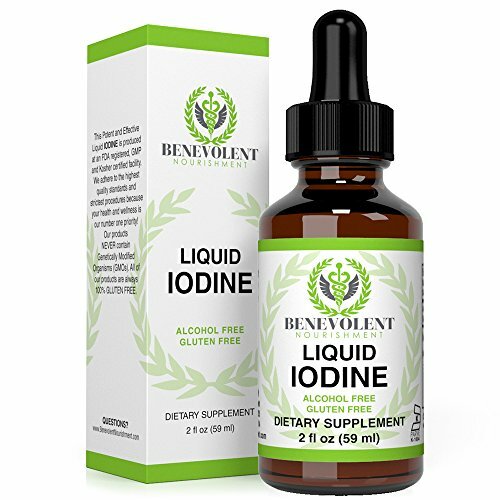 Put a drop of iodine into a tablespoon of the liquid extract on a white plate. If the extract changes color, starches are still present and mashing isn’t complete. Let the mash stay at temperature and keep checking it for conversion every 10 to 15 minutes until the extract no longer changes color when exposed to iodine. It might sound like an exotic dance from the Caucasus mountains, but the Vorlauf Step is more about recirculating grains than cutting a rug. Drain about 1 quart (.95 litres) of your extract from the mash tun tap into your pitcher. You’ll notice bits of grain in the extract, but don’t worry, this is normal. You’re going to pour this liquid back into the mash, but first, you need to prepare for a very, very gentle pour. You can do this by taking a circle of aluminum foil, poking several small holes in it with a clean, sanitized fork, and then resting it on grain bed. This will give you a shield for pouring that diffuses the force of the water and won’t disrupt the grain bed, which is acting as a natural filter for your wort. You also won’t send hot goop flying everywhere, which is nice. Pour the extract back over the mash as gently as possible. Imagine you are a leaf on the wind, or a cherry blossom on a pond, or a person who really, really doesn’t want to ruin their beer. Repeat this process, filling the pitcher with extract and pouring it back over the grain bed until the extract is running relatively clear. You’re finally ready to sparge. Open the tap on the mash tun, and let the liquid drain into your wort kettle. 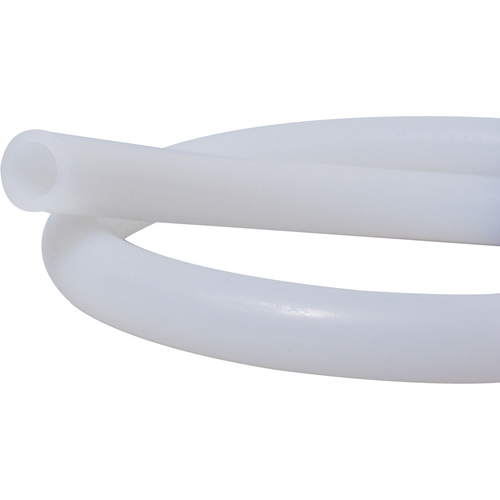 Using your heat-resistant tubing, slowly siphon the sparge water back into the mash tun and over the grains. As the extract gradually drains, carefully, and slowly pour the sparge water over the mash. Use a hose clamp if needed to regulate the flow. Keep the water level about an inch (2.5 cm) above the grain bed. Continue lautering until you have 6.5 to 7 gallons (25 to 27 litres) of wort in your wort kettle. Boil your wort for 60 to 90 minutes, or as directed by your recipe. You can add hops during this step as well, unless you’re dry hopping. 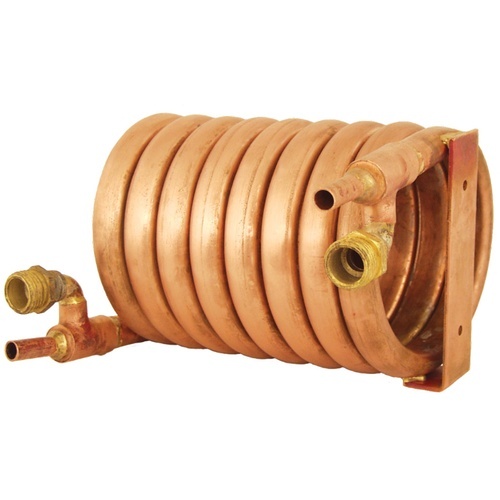 Cool your wort with a wort chiller, if you’re using one. Then all you need to do is pitch your yeast and transfer the cooled wort to your fermenter of choice. If you’re using undermodified grains and want to try the two-step infusion process, you just need to add a few steps to introduce the protein and saccharification rests. To accomplish this, you’ll follow the same steps as in the one-step infusion, but split your mash time. To begin, bring the temperature of your mash up to between 130°F and 143°F (54°C and 61.7 C), depending on the protein rest temperature specified in your recipe. Next, add water to the mash tun—1 quart per pound of grains and adjuncts (if any). This should bring your mash temperature to somewhere between 112°F and 127°F (44.4°C and 52.8°C). Hold this temperature for 20 to 30 minutes, or as directed by the recipe. When the protein rest is complete, it’s time to raise the temperature for the saccharification rest. Add boiling water to your mash in small amounts—about ½ quart (.47 litres) at a time—in order to bring the temperature up to between 150°F and 158°F 65.5°C and 70°C). Finish out your mash, then test for conversion, and proceed as in the one-step infusion. All grain brewing takes a little more time and a bit of finesse, but it’s worth the effort if you’re looking to expand your homebrew skill set and give your beers a tweak in the flavor and body departments. With the right ingredients, an eye for detail, and some extremely careful pouring, you, too can join the ranks of the all grain brewing elite.